Abrisa Technologies offers the SCHOTT AS 87 eco ultra-thin aluminosilicate glass for use as a cover or enhancement glass on low profile displays, touch sensors, and other display applications where thickness and weight are a concern. 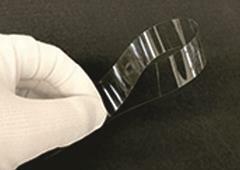 The glass features extremely high levels of bending and impact strength, and superior scratch resistance qualities. The SCHOTT AS 87 eco comes with the option of providing HIE™ chemical strengthening to the material for even higher levels of Knoop and Vicker’s hardness. Abrisa Technologies also offers customization options for size, shape, optical coatings, screen printed graphics, and oleo/hydrophobic coatings. For more features, specifications, and benefits on the SCHOTT AS 87 eco ultra-thin aluminosilicate glass, download the datasheet.